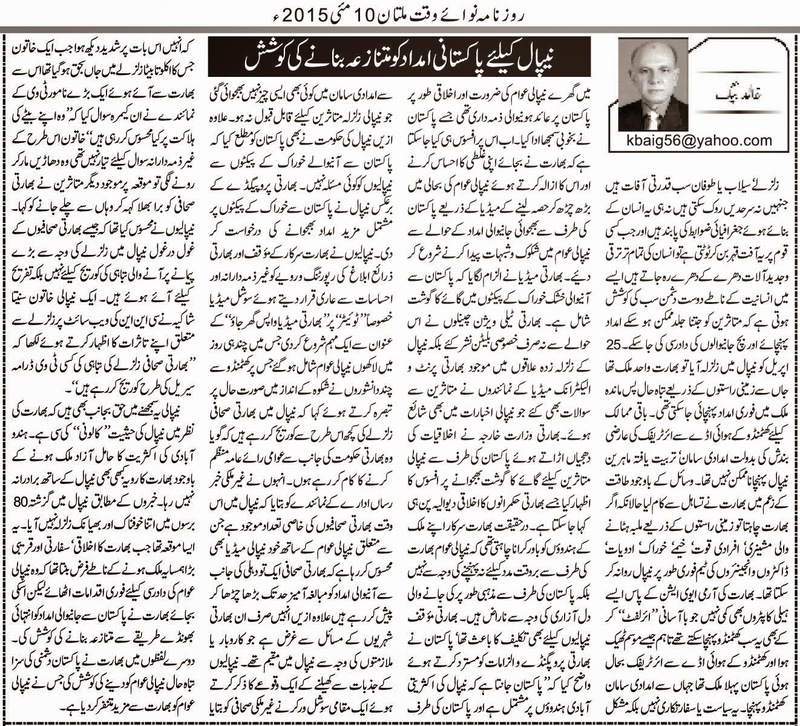 Truth by Kbaig: Indian Attempt to Create Misunderstandings over Pakistani Aid to Nepal!!! Indian Attempt to Create Misunderstandings over Pakistani Aid to Nepal!!! Earthquakes, floods and other natural calamities are neither stoppable by borders nor they follow human made laws. When natural calamities strike a nation all the human development and latest machinery becomes useless. In such a situation even enemies try to provide aid as quickly as possible on the basis of humanity. 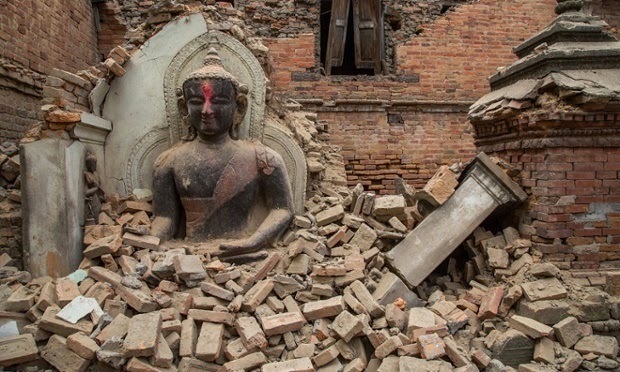 25th April 2015, is the day when Nepal was struck by the worst earthquake; in such situation India was the only country that had the ground access to Nepal to send aid to Nepal. Other countries were unable to send their rescue parties and aid due to temporarily closure of Kathmandu Airport. Despite of having the required resources, India showed sluggishness in sending aid to Nepal, India might had sent machinery to remove debris, manpower, tents, food, medicines and doctors etc via ground routes to save precious lives of earthquake struck Nepalese. India Army Aviation has such helicopters that could have airlifted heavy machinery for removal of debris at Kathmandu. 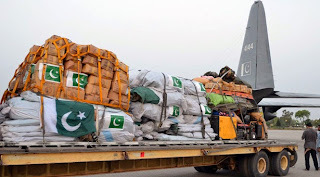 However, as soon as the air traffic to Kathmandu airport was restored by improvement in the weather, Pakistan was the first whose airplane reached Nepal along with rescue teams and aid. This was neither diplomatic nor political move but Pakistan was fulfilling just her moral duty towards Nepalese. 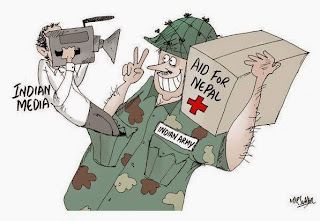 India in spite of correcting her mistake by sending aid to Nepal and taking part in the rehabilitation of the earthquake struck Nepalese started propaganda over the aid from Pakistan in order to create misunderstandings in Nepalese public. Indian media started propaganda that dry food from Pakistan contains meet of cow, special news bulletins were telecasted, and representatives of Indian print and electronic media started asking questions from earthquake effected Nepalese regarding Pakistani food allegedly containing cow meat, which were also published in Nepalese newspapers. Indian Foreign Minister expressed concerns over alleged cow meet sent meet by Pakistan that shows moral shallowness of Indian rulers. Maybe Indian rulers wanted to divert attention of world especially Hindus in India that Nepalese are not angry over Indian sluggishness in aid but hurting their religious feelings by Pakistan. 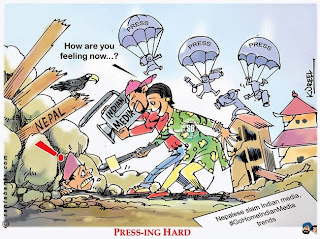 Indian propaganda was much painful for Nepalese in such a hard time. Pakistan rejected Indian propaganda and clarified that Pakistan is aware that majority of Nepalese population is Hindu therefore Pakistan had not sent anything in aid goods that might unacceptable for Nepalese. Nepalese govt. made it clear that they have no objection over Pakistani food. In contrast to Indian propaganda Nepalese requested Pakistan to send more packets of dried food. Nepalese have declared Indian Foreign Minister’s statement and reporting by Indian Media as irresponsible and devoid of human feelings. 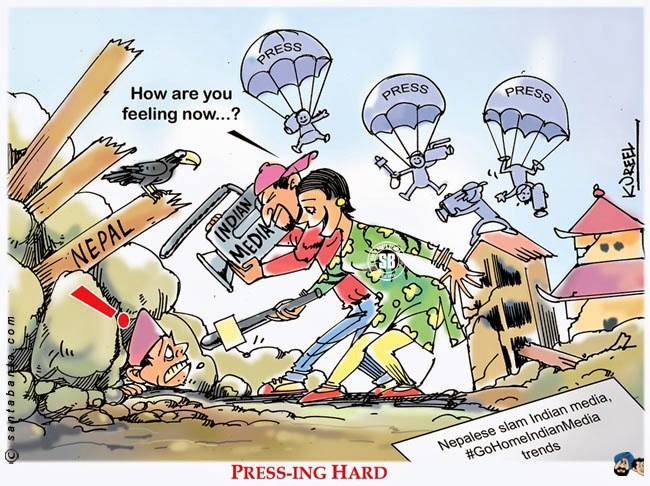 In reaction to Indian propaganda Nepalese launched “#GoHomeIndianMedia” campaign over social media especially twitter, that became popular in masses of Nepalese within few days. Few Nepalese intellectuals have expressed concerns that it seems that Indian media representatives have been sent to form public opinion as per commands of New Delhi. Nepalese told media representatives from other counties that Nepali media along with public is feeling that Indian media representatives are over presenting Indian aid and moreover they are only concerned with the problems of Indian citizens who were present in Nepal either for business or employment. A local social worker told international media that he was shocked when he saw an Indian journalist asking a Nepali woman whose only son was killed in earthquake that how she is feeling over the death of her only son. Poor woman was not ready for such stupid question and started crying due to which locals asked Indian journalist to leave at once. This is not the only incident when Indian journalists were seen playing with the emotions of Nepalese. According to Nepalese a large number of Indian journalists are not coming to Nepal to give coverage to earthquake but for personal entertainment. 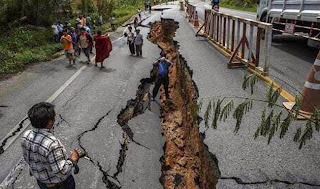 A Nepali women, Sanita Shakia has expressed her feelings over CNN’s website that Indian media is covering destruction by earthquake as a TV serial or Drama. Nepalese have felt in such situation that India treats Nepal as a colony. Despite of being an independent Hindu country, India never had brotherly relations with Nepal. According to reports this was the worst earthquake in last 80 years that ever hit Nepal. In such a situation besides being a Hindu country as Nepal has majority of Hindus as moral, diplomatic and neighbor country this was duty of Hindu India to help Nepali public but in spite of providing relief goods India attempted to create chaos over Pakistani aid and stop it in a very pitiful manner.